The Brahma Sampradaya (Brahma-sampradāya) refers to the disciplic succession (sampradaya) of gurus starting with Brahma. The term is most often used to refer to the beliefs and teachings of Madhvacharya and his Dvaita philosophy. The term Brahma-Madhva-Gaudiya Vaisnava Sampradaya is used to refer to the teachings of Chaitanya Mahaprabhu and his Gaudiya theology. 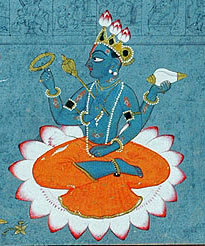 Followers of this tradition believe that Vedic knowledge descends from Brahma. In the Vedic conception, these sampradayas began at the creation of the universe and endure to the present moment due to the consistency of the transmission of knowledge, all the previous gurus are present in the teachings of the present spiritual master. The Vedic process assures that the transmission remains pure by assuring the qualifications of the transmitter."